The first step in SAdhanA-chatushTayaM, is NityAnitya-vastu-vivekaM. 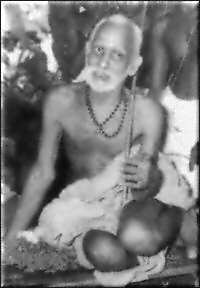 Doing our karmas sincerely and systematically as per the ShAstras, dedicating all of them to Ishvara, doing bhakti towards that Ishvara, by means of these attaining a certain purification in the mind, as well as obtaining a capability to keep the mind steady on one thing – all these constitute the first stage. First stage, not in jnAna yoga, but in the spiritual dimensional journey of the jIva. This belongs to karma yoga only. The second stage begins after this and that is the first stage in jnAna yoga. And in that, the first subject of mention is ‘nityAnitya-vastu-vivekaM’. So now let us asume that we have all reached that maturity resulting from the observance of karma and bhakti. [The Swamigal adds with a smile]: Let us build castles in the air, or cheat ourselves so and start to learn the ways of jnAna yoga. We certainly do a lot of castle-building and self-cheating; let us now do it for some good purpose!